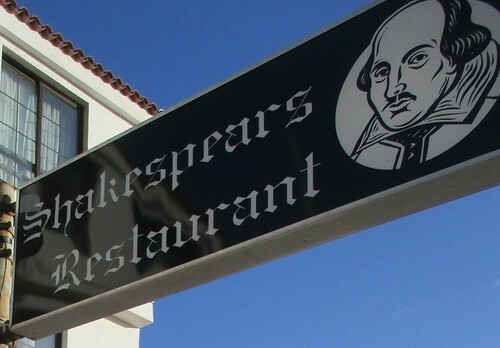 Good food and drink takes centre stage at New Shakespeare’s in Oasis del Sur, Los Cristiasnos, and there’s plenty of favourite British meals and snacks for all tastes, budgets, and ages. Hosts Nick, from Wigan, and Sue from Leicestershire have decades of catering in Tenerife behind them, and have some special attractions throughout the week. I have to confess to a weakness for the deep crust Meat and Potato pie, you can’t beat a wall of crumbly pastry to set off that home made taste. Battered Fish and Chips, Chicken Curry Special, and BBQ Chicken melt keep tempting me astray, and there’s plenty more old timers like Bangers, Mash and Cabbage, or Pasta Bolognese Bake, waiting in the wings. The 10 oz Sirloin Steak is the only main meal that stretches over the 10 euro barrier, and there ‘s a shorter 2 meals for 12.99 selection. 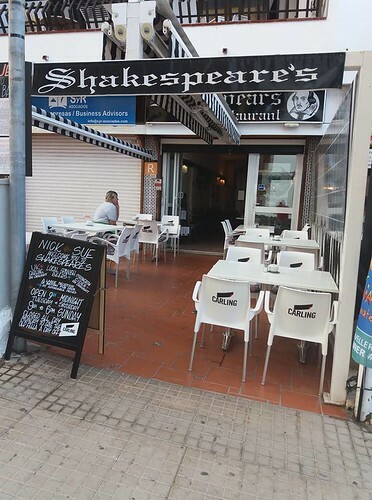 There’s nothing more traditional then a Sunday Roast, even when lapping up the Tenerife sun, Shakespeare’s offers four meats, chicken, pork, beef, or lamb, individually or as a combination. 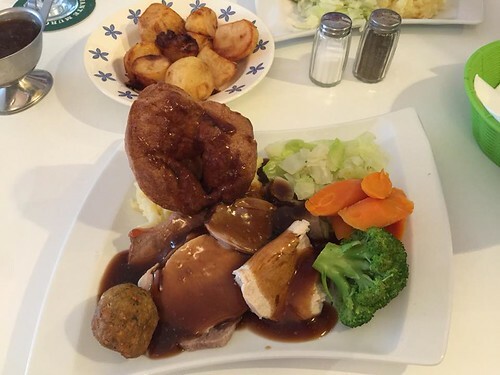 Add a Yorkshire Pudding, Mashed and Roast Potatoes, Stuffing and Meat Stock Gravy, and you can see why booking for the 12.30 to 5 pm servings is essential. How about kick starting the day with a breakfast deal. 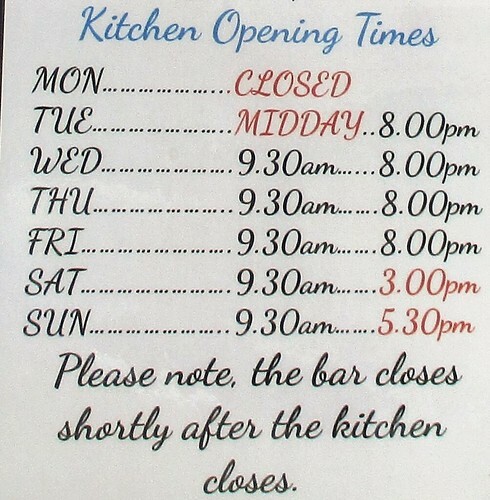 Full English, Full Scottish, Full Monty, or Vegetarian, all with fried, poached, or scrambled eggs. Maybe a snack is what you need. Jacket Spuds with Atlantic Prawns, or Sausage, Fried Onions, and Cheese might hit the spot, or the Salads come with their own tempting range of goodies. Then there’s a colossal range of Sandwiches and Toasties, or a Kids Menu, complete with pop or fruit juice, and a lolly or ice cream, for just 5 euros. 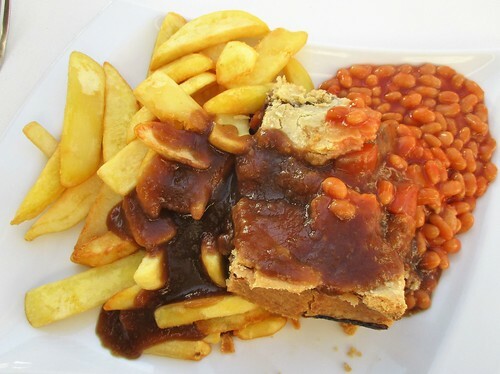 Your probably getting the idea by now that there are a lot of choices at Shakespeare’s, you can also add Friday Chippy Night with Wholetail Scampi, Fish Cakes, and Battered Sausage fighting the Large Battered Cod for top billing. If Gin is the new Rock and Roll, Sue has a packed jukebox on her bar. 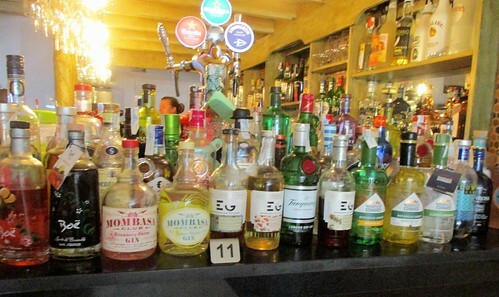 At last count the Gin counter was groaning under the weight of 89 flavoured bottles. All this good living is sure to sharpen the brain, Thursday nights mean the Fun Quiz for charity from 8.30 pm. Big screen TVs inside will ensure you can catch all the top sporting events. You can keep track of the latest offers at Facebook or pop in at the top of hill straight up from Los Cristianos fountain roundabout.